#6 DUKE 77, Tennessee (Volunteers, 27,523 students, Knoxville, TN) 67 – Austin Rivers shook off some early mistakes to hit four 3-pointers and score 18 points, lifting the No. 6 Blue Devils (5-0) to a win over Tennessee (2-1) in the first round of the Duke Hawaiian (Maui) Invitational on Monday. N.C. STATE 77, Texas (Longhorns, 38,463 students, Austin, TX) 74 – Fueled by a dramatic 28-2 run, the Wolfpack (4-1) erased an 18-point second half deficit to outlast Texas (2-2) at the TicketCity Legends Classic. State’s C.J. Leslie leading the way with a 17 point outing, going 4-of-8 and 9-of-16 from the line. Scott Wood made his return from an ankle injury suffered against Princeton, scoring 16. Lorenzo Brown scored 11 and lead the Pack with four assists. 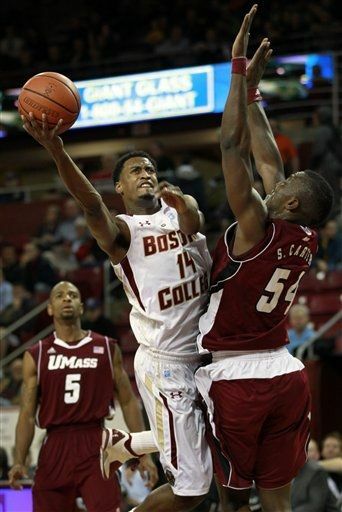 Massachusetts (Minutemen, 21,373 students, Amherst, MA) 82, BOSTON COLLEGE 46 – Freshman Patrick Heckmann led Boston College (1-2) with 11 points while junior Matt Humphrey added 10 as the Eagles lost at home to Massachusetts (4-0). Heckmann went 9-for-12 from the foul line and connected on his first seven free throws early in the game. He also had five rebounds. VIRGINIA 60, Drake (Bulldogs, 3,164 studetns, Des Moines, IA) 52 – Sophomore guard Joe Harris scored a game-high 18 points and senior forward Mike Scott scored 14 points and had a game-high nine rebounds to lead Virginia (4-2) to a victory over Drake (1-2) at the 2011 U. S. Virgin Islands Paradise Jam.